Jozart CFTA announces new Writers’ Group; weaves together worlds with writers’ words. Writing is an art that speaks, and Jozart Center for the Arts hopes to raise its voice with the Center’s newly revamped Writers’ Group. Writers of all backgrounds – fiction, nonfiction, or individuals who simply appreciate the English language – are invited to attend the Jozart Writers’ Group, hosted every second and fourth Wednesday of the month at 7pm and free to the public. Robison said she has great confidence in the Group’s new facilitator, Jonathan Romano. “I am thrilled that Jon has decided to step in and continue the Writers’ Group at Jozart. He has an amazing talent for recognizing the nuances of a story and helping people build on what they’ve already created with soft but insightful direction. He has a natural talent for writing and it’s wonderful to see him advance his own craft as well. I’m sure he’ll do very well and I look forward to being part of this group,” she said. 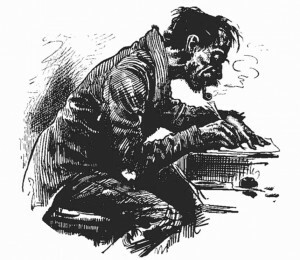 Jozart’s weekly Open Mic immediately follows the Writers’ Group at 8 pm. Writers are encouraged to stick around and share their talents with a larger audience during this event. For more information on the Writers’ Group, please contact Facilitator Jonathan Romano via the Center at carla@jozart.com or at 724-938-9730. Christmas came early this year at Jozart Center for the Arts when board members received notification from the Internal Revenue Service that Jozart is now considered a 501(c)(3) organization, a designation that’s important because donations to the Center are now fully tax deductible. “We were thrilled to finally receive the IRS determination because it’s vital to our continued growth. Having 501(c)(3) status will enable us to maintain and develop our facility and to expand our offerings,” said Carla Anderton, board president. The Center’s first priority is to improve their accessibility to the general public. They are currently soliciting donations for a chairlift to be installed in the stairwell, and are asking individuals and businesses to think of us when making charitable gifts this holiday season. According to Anderton, they’re also seeking grant funding to help defray the costs of installing the lift, but have to be able to show matching funds. There are three ways to donate to the Center’s chairlift fund: visit the Center during an event and place your contribution in the fishbowl at the front desk, mail a check or money order to Jozart CFTA, 333 Second Street, California PA 15419 or send your donation via PayPal to paypal@jozart.com. Again, all contributions are fully tax-deductible as the Center is a qualifying 501(c)(3) organization. To celebrate their new status, Jozart’s board is planning a holiday Open House on Saturday, December 17 from 4-6 p.m. They invite you to visit the Center, enjoy complimentary hors d’oeuvre, baked goods and hot and cold beverages, listen to live music and learn more about Jozart’s classes and other events. 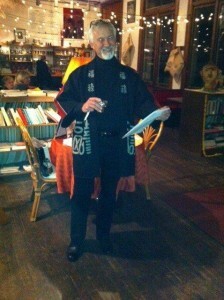 12/2/11 – 6-8 p.m. – Coffee Shop open in conjunction with California’s “Bright Night” – Free coffee, discounts on other items. Afterward, youth are invited to an “electronic dance party” from 8-11 p.m. This is an alcohol free event. Tickets $5. 12/3/11 – 7 p.m. – Youth musical act Advent Skies with opener Cat Zisk. All ages, alcohol free show. Tickets $5. 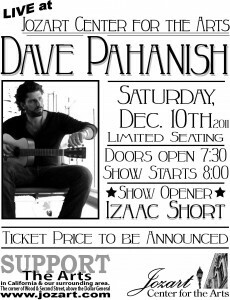 12/10/11 – 8 p.m. – Dave Pahanish with opener Izaac Short. Doors open at 7:30 p.m. BYOB for over 21 event. Tickets $15 in advance, $20 at the door. To reserve tickets to any Jozart event please email Carla@jozart.com or call the Center at (724) 938-9730 or stop by any regular event. Don’t forget the beat goes on every Wednesday night at the Center’s longstanding Open Mic from 8-11 p.m., hosted by Peter Wright and featuring the best local talent around. Jozart’s café is also open during the event, serving coffee, tea, soda and light snacks. For art enthusiasts, Terry Binkney continues “Open Easel” sessions on Monday from 10 a.m.-9 p.m. and Wednesday from 10 a.m.-5 p.m. The Center is also now home to new classes. Zumba with Lynne Langley continues every Saturday morning at 10 a.m., but now Lynne’s also offering two “Yoga, Pilates & Abs – Oh My!” weekly sessions as well, one on Tuesday evenings at 7:30 p.m. and Sunday nights also at 7:30 p.m. Cal U student dancer Brianna Nicole’s now offering Hip Hop dance classes on Sunday nights at 6 p.m. Finally, the Center continues to offer guitar, drum and mandolin instruction by appointment. For more information on any class, email Carla@jozart.com or call the Center. “There’s nothing to do in California”?!?!? You’ve heard the phrase “there’s nothing to do in California” but that’s simply not true at the Jozart Center for the Arts, beginning in November and continuing through February 2012. Coming in January, stay tuned for a special evening with Jack the Ripper! Details about this event and other “Evenings with the Author” TBA shortly. Finally, mark your calendars for the Second Annual Youth Talent Revue on February 25, 2012. Talented youth still needed for this event. FMI, email Carla@jozart.com. Saturday, September 24 – “Your Forgotten Friend”, winners of the first annual Youth Battle of the Bands, will perform with “Scheduled Reality” and another act TBA. Doors open at 7:30 pm. Tickets $5. All ages, alcohol free event. 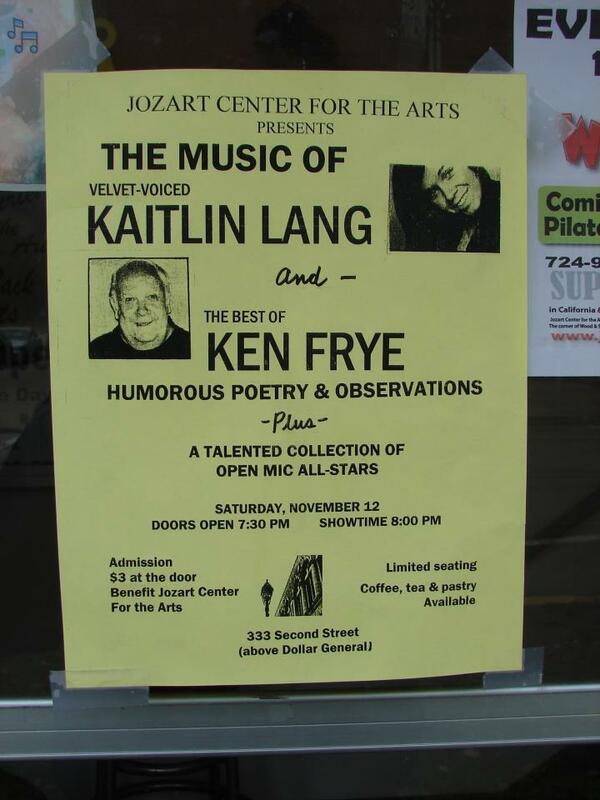 Date TBA – Poet Ken Frye will perform with Lyricist Kaitlin Lang. Doors open at 7:30 pm, Show begins at 8. Ticket prices TBA. All ages, alcohol free event. Wednesday, October 26 – Annual Open Mic Halloween Party. Come in costume. Prizes awarded. Event begins at 8 p.m., is free and open to the public, and is alcohol free. Thursday, October 27 – “Black Syrup” Art Exhibit Opening, featuring the work of artist Matthew Holesapple. Exhibit opens at 12 Noon. Saturday, November 19 – Second annual “Youth Talent Revue” featuring the talents of area pre-professional youth including dancer Allen Free and musicians Cat Zisk and Sully Dunn. Doors open at 7:30 pm, show begins at 8. All ages, alcohol free event. Regular, weekly events: Wednesday Open Mic Nights from 8-11 pm with host Peter Wright. Performers sign up for slots. All ages, alcohol free event. Open Easel Sessions with artist Terry Binkney on Mondays from 10 am-9 pm and Wednesdays from 10 am-5 pm. Zumba with Lynne Hayes Langley Saturdays at 10 am and Thursdays at 7:30 pm. Yoga with Paula Sabo Tuesdays at 5 pm. Jozart continues to offer guitar, mandolin and drum instruction by appointment with Duane Galensky and Rob Berletich, respectively. Also, the facility is available for rental for your special event. 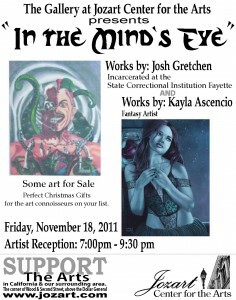 FMI, visit the Jozart site at www.jozart.com or call 724-938-9730.